From overall health awareness to specific test results, a community health fair is an effective method to take charge of your health and save money. In many cases, participants have access to hundreds (if not thousands ) of dollars of blood work at a low price, by the same medical personnel you might see at a regular doctor visit. With tests like bone density, lung cancer risk, heart attack and stroke risk screenings and even skin cancer education, attendees have access to a variety of tests in one central location, along with free medical advice by qualified professionals. This is an event one should try to experience at least once a year. Pull that Treadmill out of the Shed! With the Winter Vortex in full swing, you many longingly look out the window, dreaming of the place you could be running to. But instead of sitting on the couch watching This is Us, you CAN still walk and run this winter. From fancy features like music and television capabilities, the treadmill doesn’t have to be a dreaded workout method. Another new trend is the treadmill workout. In gyms across the US, gym members and their coaches are using treadmills in new ways, combining music, moves and variations in routines to maximize treadmill time. For those training for summer races or looking to achieve specific goals, many of the newer treadmills offer metrics to measure your achievements. And with no environmental challenges (rough running surfaces, traffic, or distractions), you can challenge your running mates in the safety of the gym! Borne in Australia, this high energy workout method combines the best of the HIIT method in a 45-minute (hence the “45” in F45) routine. With a choice of 31 themed workouts, there is something for everyone in this unique and heart-pumping approach. Found in hundreds of gyms across the US, this is one style worth adding to your arsenal; the combination of strength training and cardio is a proven method for ultimate fitness results. With its laid-back culture reminiscent of Australia, many people tout the fun and friendly experience they have had while participating. I know, jumping rope sounds like child’s play. But this relatively easy activity requires nothing fancy—just a rope with a handle on each end—and is something you already know how to do. In fact, a 2013 Harvard study found that a 10 minute rope jumping fitness session had the same cardiovascular effects of 30 minutes of jogging. This low-impact, muscle engaging workout is cheap and easy to do anywhere. While varying your footwork (hops and jumps, high knees, and one or two-foot landings), you can create a custom workout with the highs and lows of a traditional HIIT routine. More than just an exercise bike for spinning, the Peleton bike comes with its own culture. As just one (albeit large) part of a host of workouts, including cycling, running, boot-camp, yoga, and outdoor, this is more than a fitness device. The pricey machine comes with a screen chock-full of workout options, from some of the most charismatic instructors teaching live (over 20 available every day) and on-demand classes, to personal kudos when you reach a multitude of milestones, this is just what you need to build a community online and stay motivated. Just don’t let the sticker price shock you—many users declare it wasn’t long after purchase that its value truly shone through. Another option for cold winter months, an indoor pool is a warm and inviting place to work out. A variation of HIIT workouts, high energy aqua workouts (HEAT) are a variation of more common Pilates or HIIT workouts, with the added resistance of water. Water exercises have been proven effective, keep the body temperature steady, and are easier on joints. This makes for a perfect option for those recovering from an injury or looking to expand into traditional HIIT (or F45, if you dare) workouts. One part of fitness which many athletes are known to overlook is your respiratory system. Improving your lung function provides more oxygen to your working muscles, increases stamina and reduces recovery time. Adding a respiratory muscle training device like the Powerlung is an easy addition to your established routine. Taking as little as 10 minutes a day and small enough to take anywhere, consider adding the Powerlung to your arsenal of fitness tools. February is a perfect time to take care of your respiratory system—these fitness ideas offer a variety of options for most people looking to add something new to a workout routine. 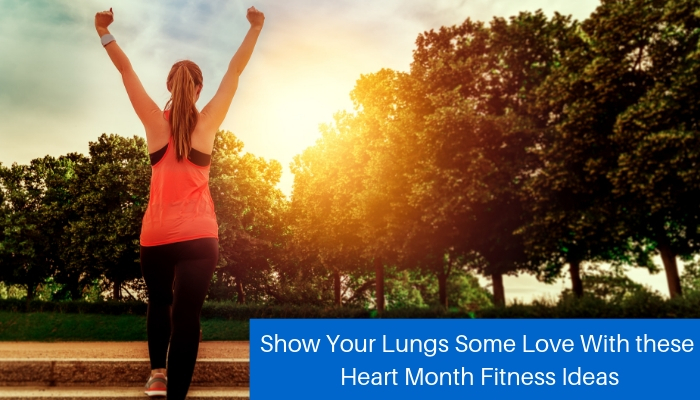 Additionally, many gyms offer specials for Valentine’s day and New Years resolutions, so look for opportunities to try a single day membership or trial, experiencing a few different methods until you find the “perfect fit.” During this month of love, show your lungs some love!